Save, spend, earn and learn! 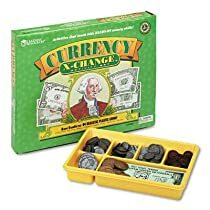 Teach kids how to handle money! Contains 101 plastic coins and 100 paper bills, all realistically sized, plus a sturdy plastic money tray for storage. Games/Manipulatives Type: Money; Age Recommendation: Grades K and Up; Number of Cards: N/A; For Use With: N/A.